Call Your Remodeling Experts Today! Our two top of the line cabinets are Shiloh and Sequoia. Aspect (formerly Sequoia) cabinetry features ½” plywood drawer box with concealed, under mount drawer guide, ½” cabinet sides with ¼” plywood veneer added to finished sides. Interior of cabinets is laminated in a natural maple pattern for easy clean-up. Solid wood hanging rails for sturdy installation and catalyzed conversion varnish finish for durability. Shiloh cabinetry features ¾” edge-banded plywood or ¾” solid hardwood dovetailed with ¼” plywood bottoms fully finished for smooth surface and easy cleaning. Face frames are constructed of solid ¾” kiln dried lumber, side, top and bottom stile are 1 ½”. Frames area drilled glued and joined by screw type fasteners to provide a strong durable joint. Blumotion full extension guides for dovetail and plywood drawers are 100 lb self closing, under-mount concealed guides. Exterior finish consists of two coats of catalyzed varnish topcoat. Interior of cabinets is laminated in natural maple pattern for easy clean-up. A newly remodeled bathroom will bring a lot of style to your home, and can significantly increase the value of your home above and beyond the amount spent on the remodeling process. For example, a leaky faucet or a toilet that runs constantly can increase your water bill dramatically. There can also be health benefits from remodeling your bathroom if the current ventilation system is inadequate. An efficient ventilation system that quickly removes moisture can eliminate mold, mildew, and odor problems. We can also do bathroom remodeling to suit the needs of mobility-impaired individuals or the elderly. We can advise you on the best layout of your bathroom, install grab-bars to provide easier access to tub or toilet, install a walk-in shower, or do any number of things to make access easier. 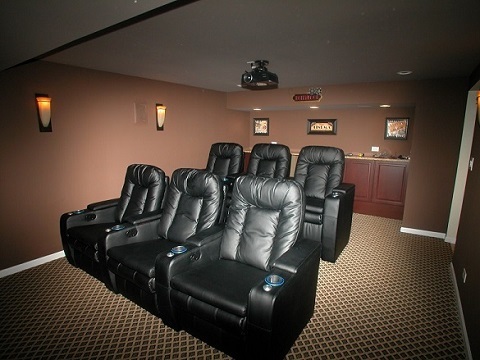 Fully finished, professionally remodeled basements have lots of potential uses. Right now, your unfinished basement is probably home to your washer and dryer and serves as unorganized, catch-all storage. But imagine that your basement was divided up into separate rooms, each with a specific function, and the possibilities become endless. In addition to a separate laundry room and some really organized storage space, you could add a home office, extra bedrooms, another bathroom, an exercise room, or even a home theater with surround sound and a big screen TV. If you live in an older home, or one that was built without quality windows, then chances are a lot of your heat is literally going out the windows doubling your energy bills New double or triple paned windows can save you 15-40% on your energy bills. As an additional benefit, new windows can also shield you from up to 84% of harmful UV rays and reduce street noise. You can also lose a lot of heat through a door that does not seal well, particularly sliding glass doors of older design. Newer sliding glass doors are much more energy efficient, and may actually lose less heat than regular windows. Energy efficient French doors and other decorative doors are available as well, making it possible to be stylish while still saving energy. A home with new windows, doors and siding will increase the value of your home. Effective siding keeps moisture out and prevents the growth of biological contaminants such as mold, dust mites and bacteria. Furthermore, if rain, snow or frost gets behind the siding, the moisture makes the wall sheathing soft, degrading the strength of the entire house frame. Pests and insects may also reside behind poor siding, and over time they can also weaken the strength of your home. Modern siding, whether it is made out of vinyl, wood, brick, aluminum, or concrete, when installed properly can protect the structural integrity of your home and protect your family's health and safety. New siding can give your house a new, modern look, and may also reduce exterior maintenance. Our siding product line includes vinyl, fiber-cement and cedar siding, fascia, soffit and trim. As State Licensed roofers we can take care of all your roofing problems from re-roofing to maintenance. Re-roofing is the process of installing a new roof when the existing roofing system fails. Repair is a process where an existing roofing system has additions and adjustments made to it. Typically after locating penetration/leaks in the roofing system, our service technicians will mend the roof via means such as caulking, re-roofing, or repairing. Restoration involves the major repair of the roof system, including the repair of all penetrations and resurfacing of the roof to restore it to serviceable condition. The opportunity to perform restoration work normally exists two or three years prior to the roof's end of its life cycle and before significant damage occurs. This process can include coatings, re-flashings and modern design modifications. Maintenance involves the physical inspection of an existing roofing system to determine its current condition. Early detection of leak and failures in a roofing system occur because of regularly scheduled inspections. Roof inspections and maintenance are significantly less expensive and time consuming than re-roofing. Early detection makes it possible for the company to repair and extend the life of a roof system to avoid big headaches down the road. While carpet can be ideal for some rooms in your house, nothing adds value and looks better than wood floors. There are lots of beautiful wood floor options out there, from traditional woods such as oak to something more exotic like Brazilian Cherry. If real wood floors aren't in your budget, or if you need something that needs a bit less day-to-day care, there are some beautiful laminate flooring options that can give you the exact same look as wood. 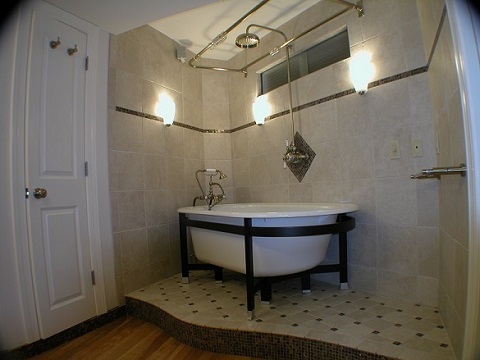 Ceramic tile is still a great choice for bathrooms, kitchens, entryways, basements, and mud rooms. It's durable, water-resistant, easy to clean, and comes in enough shapes and sizes to suit any budget or taste. When done right, nothing beats a beautiful tiling job in these areas. But regardless of which style you choose, making your room addition look as if it belongs there is always an important consideration. We can help match roof lines, architectural features, and brickwork. Room additions are complex undertakings requiring expertise in many areas of construction including (but not limited to) structural design, plumbing, electrical, and heating / cooling. Any opening of walls that change the structural look of your home may require permits from your local inspection department, host states, counties and cities set standard building codes governing room additions. But not to worry - as your general contractor, we have it all covered! 3201 W. Campbell St. Rolling Meadows IL. 1500 Touhy Ave. Elk Grove Village IL. 124 Windsor Park Dr. Carol Stream IL. 3938 W. Bell Plaine Chicago IL. Copyright: A Complete Remodeling Company, Inc.